just a word of warning .. do not get too excited I am still have a car park as focus .. although today not one at the end of commute. 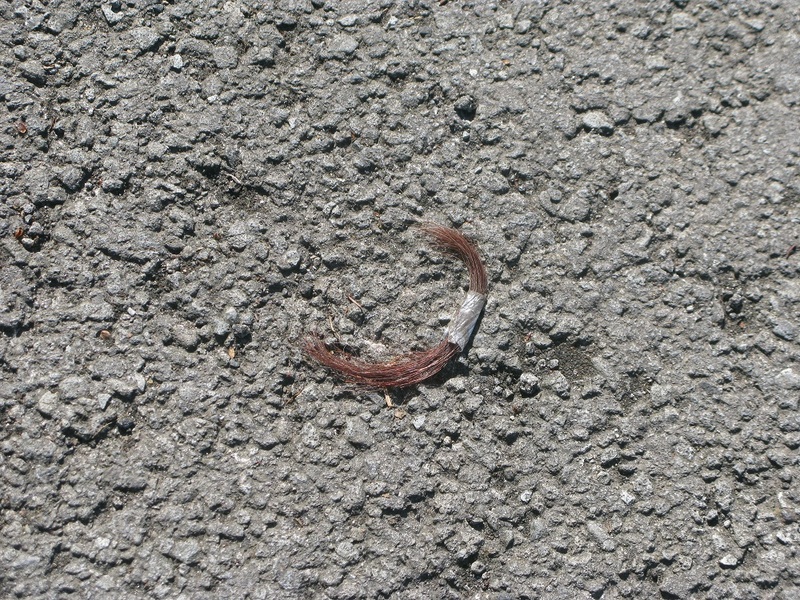 This morning I was walking through a large public car park, and thinking that perhaps the most common lost thing I see on the ground of the car park at work, and that is basically an adult space as it is for staff, are hair ties. Those stretchy bands, usually brown or black, ( to be fair not what I usually record in my treasure list .. I do prefer the shiny things) and looking around as I walked it seems this is the same here, to. Then with that thought in mind and scanning the ground, my eye was attracted to a shiny thing. The shine was the sun being reflected from a band of selotape. The sticky tape was holding together a lock of hair. The perfect thing then, expecting to find hair ties and coming across the hair, curved, tied, caught in the middle – and also shiny in the sun. Reddy-brown, quite thick. But was it real or artificial? I did not touch it … some other shiny things I will ‘capture’.. I have a little collection in the car, mainly because they are (obviously) rubbish, but hair is so emotive – I could not remove it. I had the thought that maybe someone might come back. But I did have the camera so it was captured differently. Last night when I went to refresh the parking fee there was a little black and white bear perched on the machine. Another sad loss. .and one which may have been a little traumatic. A public car park is a much bigger issue when considering treasures found, more in the order of treasures, and stories, lost. oh way more than 50 . Driving around, or being driven, taking the bus or getting the train. It is the green that hits you. Bright young leaves on the tress gradually unfurling, set those against the dark evergreen firs. Hedges tall, where they are allowed to be useful and reach upwards and out, are frothy with hawthorn blossom and underneath, the verges sway with cow parsley foam. And places where the cow parsley does not have so tight a hold ( and it can be a suffocator ) there are verges where the Ox eye daisy spots seem to float above the grass . It is hard to think of anything more beautiful than these scenes at the moment, a gorgeous time if the year. What you don’t get whizzing along, is the detail and the other wild plants. Just perceptible those patches in purple yellow crimson and white. Need to get out and walk along the roadside more to appreciate the variety. An essential variety. I often do not have the iPad with me , so sometimes I will note down something with the intention of transferring the note to this site. However, it doesn’t often happen – the transfer that is. That little bit of distance in time from the experience seems to take away the validity of the comment in some way , the lack of currency. Also I have a small collection of pictures I have taken .. The treasures from the carpark or roadside , or commuting visual stories .. They have not got to the site… Should they? Or havet they missed their chance? Or perhaps they need a different way to be shown…. Not individually , to show when they (it)caught my eye but maybe they need a separated area, an exhibition page? This needs some consideration. Today, after a reasonable amount of rain and some sun, it is clear how quickly the roadside is greening up . And then too the roadside verge along one road has been cut ..will the Oxeye daisy still make a show this year there ? It is not easy from the car to see the variety of plants the verge can support but I can see the leaves on the roadside trees are unfurling. It is not yet complete, as the lines of the trunks and branches are ,in many cases, still visible .. But the greening continues. Wildlife spotted today? One vole started an escapade from the hedge to halfway across the cycle path then so quickly changed its mind and retreated back to the green safety. One wagtail quite happily turning over the freshly cut verge grass. A red kite circling the field next to this car park, and as I close this and get ready to start the day (proper), getting out of the car I really do expect to hear the lark , the sound if which will accompany me to the office before that journey it is overtaken by seagull type screeches. Have a nice day.